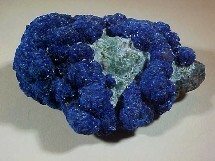 Wonderful blue spheres of azurite (after malachite?) on matrix. Superb color on this specimen. From the Morenci Mine. 2" across . The crystals are a little darker than the photo indicates. A nice miniature from the Jocao mine. 1-1/4" x 1-1/4". 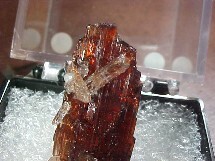 A transparent, complex phenakite from Sao Miguel de Piraciaba. A good crystal of this rare beryllium silicate. 3/4" across. 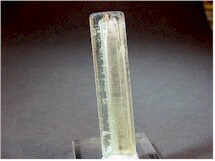 A terminated beryl crystal, no matrix. 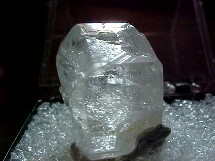 The beryl has hollow tubes running up through the center with inclusions possibly mud. A must have for the collector of unusual crystal types. 1-1/4" tall . 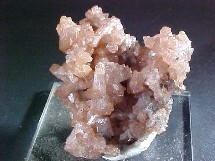 Barite: Mulinguisha, Shaba Prov., Zaire. 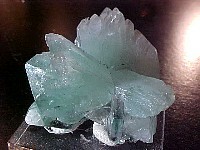 A cluster of terminated barite crystals colored blue/green by malachite inclusions. A lovely small, miniature. 1-1/4" x 1". Spessartite Garnet:Conselheiro Pena, M.G., Brazil. A nice display piece with a touch of quartz from the Navegadora mine. 1" tall.